Next time your cell phone dies, you might not need to hunt for your charger. Just drink a tall glass of water and wait 20 minutes. When you get the sudden urge to pee, you're all set: A British researcher has figured out a way to charge cell phones with urine. Okay, it's not quite that simple. But according to Dr. Ioannis Ieropoulos, urine is an ideal power source for small electronics. It should work for showers, lights, toothbrushes and razors, too. His breakthrough research is published in the journal Physical Chemistry Chemical Physics. Not to worry -- no one will be running around peeing on cell phones anytime soon. The process requires a bit of hardware to convert the energy. 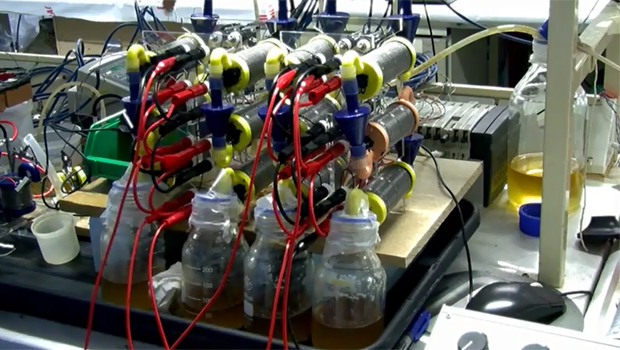 An expert in using microbial fuel cells (MFCs) to generate power, Ieropoulos is the first to figure out how to turn urine directly into energy. The MFCs contain live organisms, or bugs, just like those found in soil and human digestion. In his process, urine is basically a food source for MFCs. They produce electrons, or electricity, as they eat the urine. "One product that we can be sure of an unending supply is our own urine," Ieropoulos said in a statement. "The beauty of this fuel source is that we are not relying on the erratic nature of the wind or the sun. We are actually re-using waste to create energy." At the Bristol Robotics Laboratory in Bristol, England, jars of human urine are attached to a series of cylinders, which contain the MFCs. The urine runs through three cylinders, repeating the cycle three times. After the third pass, there's enough energy to power a cell phone. When Ieropoulos tested the MFC/urine combination on a Samsung phone, the charge lasted long enough to send a few text messages, browse the web and make a quick voice call. He sees a future where the system is installed in smart toilets that can power items throughout a house. The research is funded in part by the Gates Foundation, the Technology Strategy Board and the Engineering and Physical Sciences Research Council. "Using the ultimate waste product as a source of power to produce electricity is about as eco as it gets," Ieropoulos said in a statement. Danielle Elliot is a freelance science editor and reporter for CBS News. She holds an M.A. in science and health journalism from Columbia University and a B.A. in broadcast journalism from the University of Maryland. Follow her on Twitter - @daniellelliot.